The first games for the playoffs have started. We have some disappointing results and some surprises. 16 teams have played already. 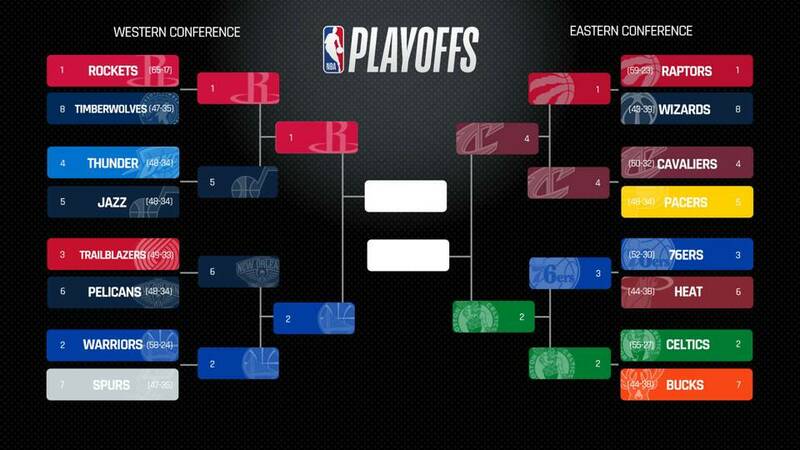 Milwaukee Bucks Vs Detroit Pistons, Houston Rockets Vs Utah Jazz, Philadelphia 76ers Vs Brooklyn Nets, Toronto Raptors Vs Orlando Magic, Denver Nuggets Vs San Antonio Spurs, Boston Celtics Vs Indiana Pacers, and Portland Trail Blazers Vs Oklahoma City Thunder. Milwaukee Bucks Vs Detroit Pistons: For the first time since 2016, the Pistons are back in the NBA playoffs and it’s been notable that the Pistons aren’t used to been in the Playoffs. The Bucks not only own the NBA’s best regular-season record at 60-22, they boast an MVP candidate in Giannis Antetokounmpo, while the status of the Pistons’ MVP, Blake Griffin, remains uncertain because of a knee injury. The Pistons were annihilated by the Bucks. Giannis Antetokounmpo had 24 points and 17 rebounds for the Bucks. Luke Kennard led the Pistons with 21 points. Houston Rockets Vs Utah Jazz: The Rockets won by 32 points following an explosive fourth quarter in which they outscored the Jazz by 20. James Harden finished the game with 29 points, 10 assists and eight rebounds in 32 minutes of action. He was one of seven Rockets to score in double figures, with Eric Gordon (17), Clint Capela (16), Chris Paul (14), PJ Tucker (11), Danuel House Jr. (11) and Kenneth Faried (11) joining him. Philadelphia 76ers Vs Brooklyn Nets: This has been one of the surprising upsets of the first round. Joel Embid’s Philadelphia 76ers were totally outplayed by the Brooklyn Nets. The Nets have not played in the playoffs since 2015 and have a standard team. Currently, they have no all stars in the team and everyone thought the 76ers were going to annihilate them. The final score was 111 to 102 for the Brooklyn Nets. For the Nets D’Angelo Russell finished with 26 points and for the 76ers Jimmy Butler with 36. Toronto Raptors Vs Orlando Magic: It looks like the Toronto Raptors are not in playoff mode. They lost 104 to 101 to the Orlando Magic. Leonard Kawhi’s 25 and Pascal Siakam’s 24 served as the pillars of Toronto’s offensive attack during the game but DJ Augustin’s three pointer with 3.4 seconds left shocked the whole arena filled with Raptors fans. Denver Nuggets Vs San Antonio Spurs: After six years the Denver Nuggets returned to the playoffs against an old rival, the San Antonio Spurs. As the two seed the Nuggets got the homecourt advantage but also the pressure to get off to a strong start. Perhaps the nerves got the better of them because they were absolutely awful from the floor. The Nuggets played awful shooting 21% from the 3 point line and were outscored 101 to 96. Boston Celtics Vs Indiana Pacers: The Celtics blew the Pacers out in the third quarter to open their 2019 postseason run with a decisive win. Marcus Morris and Kyrie Irving led the team with 20 points.Turnovers killed the Celtics in the first half. The final score was 84-74 to the Boston Celtics. Portland Trail Blazers Vs Oklahoma City Thunder: The Portland Trail Blazers faced their kryptonite team. They lost all the games during the season Against the Oklahoma Thunder but they were not going to give them an easy win. Damian Lillard scored 30 points for the Blazers and Paul George 26 for the Thunder. The final score was 104 to 99 for the Portland Trail Blazers. Golden State Warriors Vs LA Clippers: The NBA favorites, had a feast against the Los Angeles Clippers yesterday night with an amazing Stephen Curry. Curry finished with 38 points for the Warriors and Montrezl Harrell finished with 26 for the Clippers. The Warriors won 121 to 104.